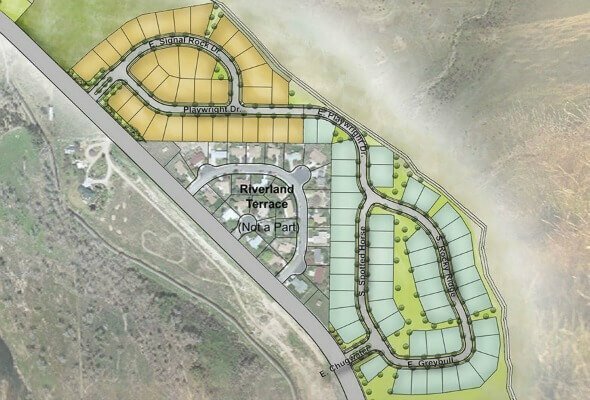 River Heights at Barber Valley is a new home community in Northeast Boise, Idaho. This well-planned neighborhood is uniquely placed between the Boise Foothills and the Boise River. River Heights real estate offers its own list of attractions including a centralized community Activity Center, including gathering and event areas, a fitness center, outdoor pool and playground. The first five phases are sold out and the sixth is complete. Phase seven was just released and lots are going fast! The newest River Heights homes feature several new designs from Brighton Homes and Alturas Homes, including daylight basements. Daylight-basement designs are perfect for entertaining yet create ideal places for family living. Browse all homes for sale in Northeast Boise. River Heights homes for sale are located off of E Warms Springs Ave past Harris Ranch. Turn left at Chugwater. To learn more about the homes for sale in River Heights, or to request a private tour, contact us online or call (208) 391-4466.